Six glorious print issues of the lovingly assembled, lavishly produced, lackadaisically printed Coilhouse periodical. At the time of the time of this writing, Issue 06 is still available in our shop, so if you’d like to experience the full-on glossy/tactile/sensory experience (and help to subsidize the cost of keeping our vast Coilhouse archival site active), click here. 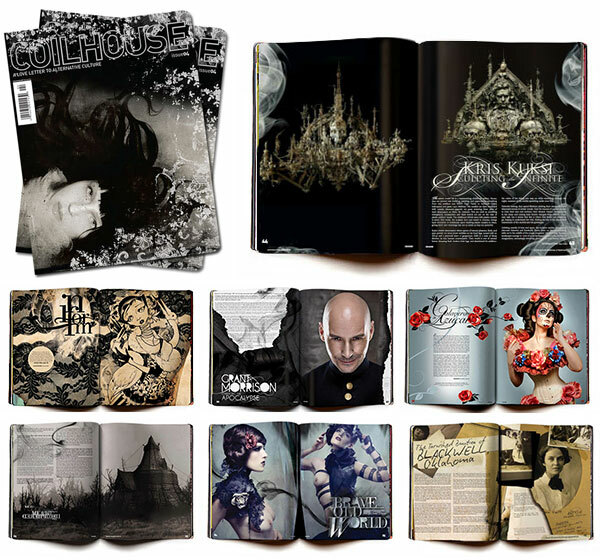 However, as issues one through five are long out of print and we have no plans to reproduce any of these magazines, we are now happily sharing ALL of them with the world as high resolution PDFs. Scroll down and click the corresponding links to download them. Published in November of 2011. Download the Issue 06 PDF. Issue 05 is ALIVE. Break out the disco ball and put on your dancing shoes, because after printing the solemn, ghostly memento mori that was #04, we’ve gone somewhere completely different with this one. We proudly present you with an issue that’s colorful, frenetic, vibrant, and celebratory. Issue 05 reflects a Coilhouse family quest for renewal and rejoicing, and there’s SO FRIGGIN’ MUCH to celebrate this time around: extensive features on fascinating artists, authors, fashion designers, photographers and musicians, a personal memoir about kinship and D&D, a dialog examining the cultural history and continuing relevance of American burlesque, an exposition of 19th century populist fiction from China, and a particularly heart-jolting paper doll. Published in June of 2010. Download the Issue 05 PDF. Issue 04: it’s haunted, you know. Or maybe it’s possessed. Could be we’ve got a grimoire on our hands. All we know is, at some point during our editorial process—which normally involves very little cauldron-stirring or eye of newt, despite whatever “coven” rumors you may have heard—#04 took on a life of its own, and has since become a small, seething portal of the uncanny. It’s all a bit magic-with-a-k. We may giggle and wink (“O R’LYEH? IA, R’LYEH!”), but that doesn’t change the fact that these pages are spellbound. You will read of channeling and scrying, of shades and shamans, and phantoms both fabricated and inexplicable. You will meet reluctant oracles, occultists, and ghosts from the past. Published in December of 2009. Download the Issue 04 PDF. Issue 03 is another badass hodgepodge of Riot(ous) design concepts containing features on the “pirate ghetto” of Kowloon Walled City and Soviet era pulp, and doll artist Marina Bychkova, breathtaking original fashion editorials shot by Gustavo Lopez Mañas and Allan Amato (featuring designer Michel Berandi), and interviews with Battlestar Galactica‘s conceptual captain Ron Moore, punk underdog Sonny Vincent, and journalist/activist/BoingBoing editor Xeni Jardin. And much, much more. Published in July of 2009. 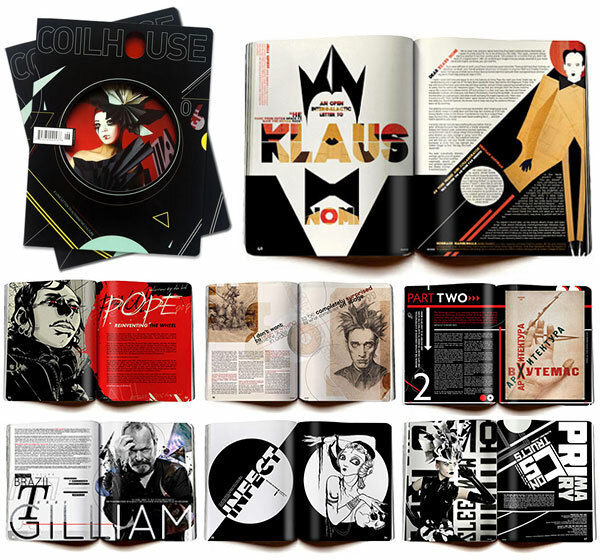 Download the Issue 03 PDF. The first issue designed by our gobsmackingly brilliant Creative Director, Courtney Riot. Courtney’s adventurous design sensibilities leave their mark on every page, giving each article a voice completely of its own. An illustrated history of cyborg hands by David Forbes, a Mark Mothersbaugh interview conducted by Jeffrey Wengrofsky, and Zo’s love letter to the magical and secret places of Los Angeles. Joshua Ellis makes a pilgrimage to the birthplace of the atomic bomb. A Coilhouse-exclusive cover shoot with Margaret Cho and Selene Luna. Interviews with artists Madeline von Foerster and Stephane Halleux. In the photography/fashion department, Gustavo Lopez Manas and Kate O’Brien’s vintage portraits of women, followed by an escapade through the trials and tribulations of vintage clothing with some familiar faces. Conversations with Mondo 2000 creator R. U. Sirius, and artist Andy Ristaino. And a set of Rococo-inspired paper dolls by Molly Crabapple. Published December of 2008. Download the Issue 02 PDF. In our premier issue, the stark android beauty created by Andy Julia for our cover is counterbalanced inside by his elegant portfolio of vintage-style nudes. There’s an exclusive 10-page showcase and interview with taxidermy sculptress Jessica Joslin. Also in Issue 01, Coilhouse travels to Ljubljana, Slovenia (literally! we actually went!) to interview Laibach, while singer Jarboe tells war stories from her career, post-Swans. Photographer Eugenio Recuenco contributes a lush 10-page portfolio and interview, while Clayton James Cubitt delivers a poignant, visceral spread (again, literally) on the topic of gender reassignment surgery and the pain of becoming. Renowned science fiction author Samuel R. Delany shares an exclusive excerpt from his forthcoming novel, From the Valley of the Nest of Spiders, while our first installment of “All Yesterday’s Parties” digs up forgotten party photos from eras long gone, starting with London’s Slimelight circa ’95. Fans of the What is Zo Wearing column will love Z’s fashion pictorial, in which she reconstructs a Galliano outfit on a budget. Pop-surrealist Travis Louie gives us a glimpse of his inner monster, and cult painter Saturno Butto has some medical fun at the expense of Catholics everywhere. 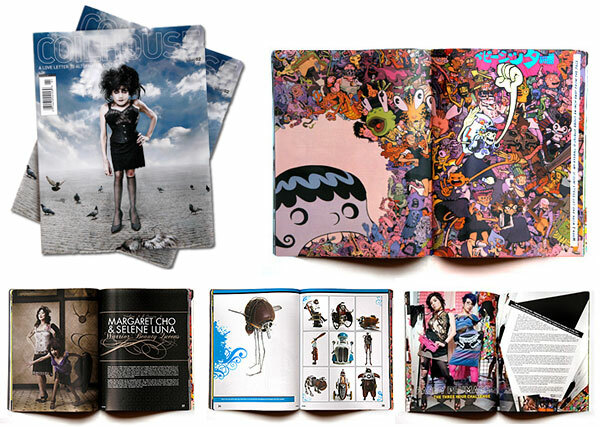 All this, and much more –including supervillain how-to’s, Coilhouse paper dolls, interviews, fashion and art– await. Published August of 2008. Download the Issue 01 PDF.